When Adolf Hitler came to power in 1933, approximately one hundred sixty thousand Jews called Berlin home. By 1943 less than five thousand remained in the nation’s capital, the epicenter of Nazism, and by the end of the war, that number had dwindled to one thousand. All the others had died in air raids, starved to death, committed suicide, or been shipped off to the death camps. 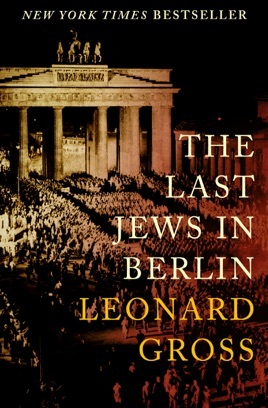 In this captivating and harrowing book, Leonard Gross details the real-life stories of a dozen Jewish men and women who spent the final twenty-seven months of World War II underground, hiding in plain sight, defying both the Gestapo and, even worse, Jewish “catchers” ready to report them to the Nazis in order to avoid the gas chambers themselves. A teenage orphan, a black-market jewel trader, a stylish young designer, and a progressive intellectual were among the few who managed to survive. Through their own resourcefulness, bravery, and at times, sheer luck, these Jews managed to evade the tragic fates of so many others. Gross has woven these true stories of perseverance into a heartbreaking, suspenseful, and moving account with the narrative force of a thriller. Compiled from extensive interviews, The Last Jews in Berlin reveals these individuals’ astounding determination, against all odds, to live each day knowing it could be their last. Leonard Gross is a journalist and author. Much of his reportage was done for Look magazine, where he served for twelve years as senior editor, Latin American correspondent, European editor, and West Coast editor. Gross has authored, coauthored, or ghostwritten a total of twenty-two books, including both novels and nonfiction. He currently lives in Bend, Oregon. Wow. I’ve read several books about Jewish people in Germany during Hitler’s reign. This book really gave the first hand experiences of several of them to this reader. Sometimes I couldn’t stop reading. I wanted to find out how they fared under some extraordinary situations. So many didn’t survive but these ones are a tribute to those lost. A powerful and soul stirring read. This book peeled back the pages of time and exposed us to a reality we didn't know and couldn't have imagined. A spine tingling true story that reads like a suspense novel! This true story is one of the best books I have ever read, and I'm sure I will go back and read it again someday. It is an outstanding story of survival under the worst circumstances possible. Imagine a whole race of people targeted for destruction by a totalitarian government with almost no way out. Yet some find a way to survive through the help of the few who are willing to risk their own lives for the benefit of others. I could not put this book down!